This DVD release from Kino has been the source of all of the “seasonal” movies I’ve reviewed in the past month, and now I want to take a moment to review the DVD itself. It is a surprisingly good quality disc, although with few features or bonuses. 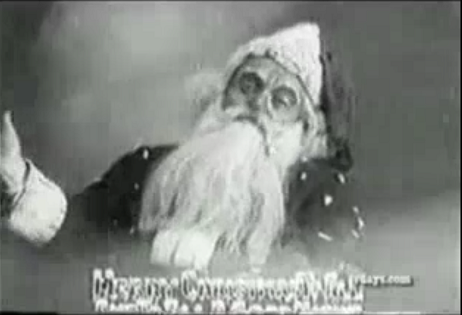 It includes the eight movies I reviewed, and also the 1925 two-reeler “Santa Claus,” which was shot in Alaska and is also well worth seeing. The chapter menu includes thumbnail video to show you what you’ll see, and each one includes music by Al Kryszak that seems well chosen for the mood, if somewhat simplistic and at times redundant. What I found especially interesting about the collection is what it says about the relationship between the media and Christmas. When I recently heard Lou Lumenick speak at a screening of “Miracle on 34th Street,” he said that it was the first instance of a “secular Christmas” movie being made, but this disc proves that thesis wrong. 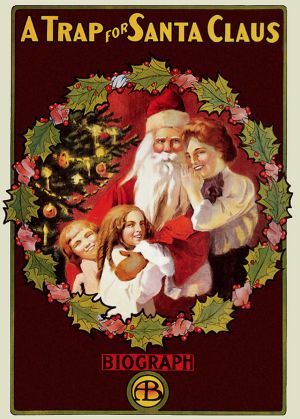 None of these movies has an overtly religious theme, and the closest we come to actual moralizing or overt spirituality is the adaptation of Charles Dickens’s 19th Century “A Christmas Carol.” In general, it seems to me that filmmakers, including such luminaries as D.W. Griffith and Edwin S. Porter, realized from an early time that Christmas movies needed to appeal to a broad audience and to emphasize childhood innocence and family rather than divisive religious questions. Santa Claus is a common theme in these movies, and whether he is portrayed as “real” or not, he represents an inclusive concept of love and generosity, not a specifically Christian Saint Nicholas, much as seen in “Miracle” thirty years later. Although the movies themselves varied for me in terms of enjoyment and interest, the whole package is a good historical examination of a theme that often goes overlooked in standard film histories. I suspect that this disc will remain a holiday tradition at my house for some time to come.